(Catasauqua, PA – January 23, 2018) YesterTec Kitchen Works is pleased to announce a major expansion to its popular Stealth Kitchen Modules (SKM) with a new line of base and island modules that provide greater design flexibility while maintaining a sleek, contemporary vibe. Created to complement full-height Stealth Kitchen Module units that can hide traditional appliances, the new modules have a compact design that is perfect for use as a work island or to house an exposed sink or gas cooktop. Used together or standing alone, they offer an ideal solution for hospitality and executive scenarios where the kitchen should virtually disappear. The UK72B-OCRS mini kitchen shown here is one example of the possibilities offered by the new Stealth bases and islands. Measuring just six feet wide and 29” deep, this particular design is crafted of white oak and features a flush-mounted double burner induction cooktop, a concealed sink under a removable cutting board, a concealed convection/microwave oven, and a concealed refrigerator with freezer and ice maker. There are three storage drawers and an optional pop-up countertop expansion that can serve as a prep space or an eating counter. This deceptively simple unit provides the means to prepare for a full dinner party, yet it requires precious little space and hides cleanly away when not in use. YesterTec is known for its extraordinary craftsmanship and heirloom quality, and the new additions to its Stealth Kitchen Module collection are no exception. They offer the same streamlined look and minimalist vibe that are hallmarks of the Stealth line. Each unit is detailed to complement the full-size pieces, making it easy to create a beautifully cohesive design. Drawer and door panels may be chosen to match or contrast with the rest of the unit, and a wide variety of finishes allow customers to tailor a custom look according to their own personal style. Stealth bases and islands are particularly well suited for hospitality settings such as an extended stay suite or luxurious resort. Their compact dimensions make them a smooth fit in settings where space is at a premium. Position them under a window or against a wall under a flat-screen television. 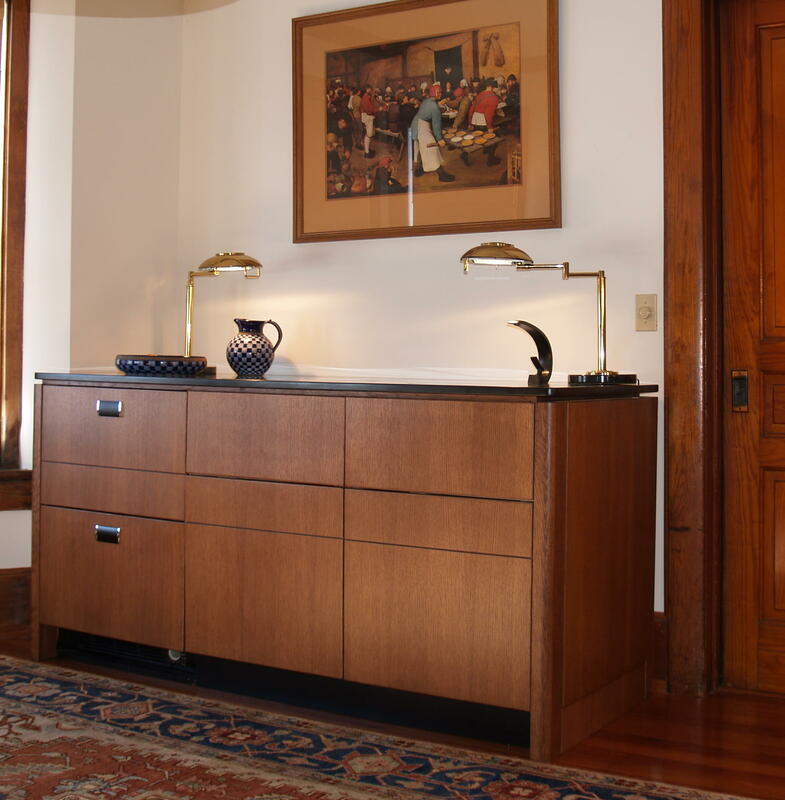 In addition to concealed appliances, the units offer capacious storage and counter space which is always appreciated. 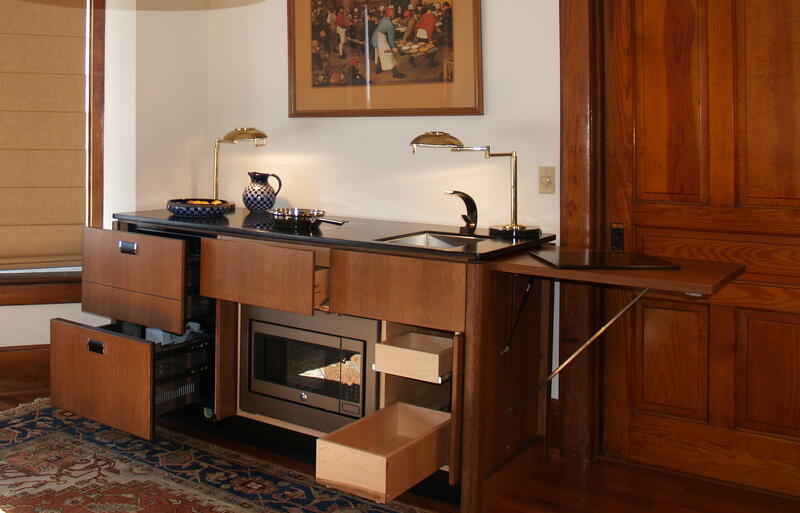 They also provide stylish kitchen solutions for small condos, executive offices, senior living apartments or a home theatre or game room. They are simple to install and may be packed up and moved from one location to another. 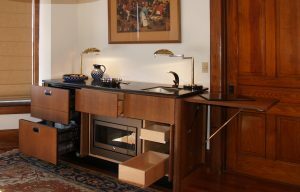 YesterTec mini-kitchens feature the company’s unique technology that allows built-in cooking appliances to be safely concealed. The oven will not function behind closed doors. Only when the doors are opened and slid into their pockets will the power to the appliances be activated. Click to View the entire article as published by Linda Jennings. Click here to see more information about these new Stealth units and be sure to view the Selection Sheet at the bottom of the article that diagrams all of the new models.